Study of the spectroscopic properties of ions in the gaseous phase, a state of matter which by definition is highly diluted, requires the use of very specific experimental methods. Scientists at Orsay, Lille, and SOLEIL, have developed a method based on the comparison of 2 analysis techniques, implemented on the DESIRS and PLEIADES beamlines, for obtaining the absolute cross-sections of a photoionisation reaction. Spectroscopy is the study of a physical system through its interaction with electromagnetic radiation. Thus, measurement of the attenuation of electromagnetic radiation as a function of wavelength yields the absorption spectrum of the irradiated system. In this type of spectrum, the wavelength of the signal is related to the energy of the physical processes. When the intensity of the spectra is measured using standardised units, the measurement is an absolute measurement for comparison of different systems and for calculation of the probability of occurrence and of the kinetics of the relaxation phenomena following the absorption. Nevertheless, absolute measurement of intensities is not easy and requires an as precise as possible knowledge of all the experimental parameters involved in the measurement. Where systems are highly diluted, specialised experimental methods must be implemented. Sometimes it is not possible to measure the attenuation of a beam of light crossing a sample because it is too dilute, the sample then being considered as optically thin. The study of the spectroscopic properties of ions in the gaseous phase pertains to this situation and involves measuring the irradiation products, i.e. the consequences of the absorption, as a function of the wavelength. This is referred to as action spectroscopy. Two main types of experiment are generally used in ion spectroscopy: merged-beams experiments and experiments using ion traps. In merged-beams experiments, an intense beam of ions is overlapped by a collinear beam of light at a large distance (0.5 to 1 m). The irradiation products are then analysed downstream of the interaction zone. A set-up of this type, the MAIA experiment, is installed at the SOLEIL synchrotron on the PLEIADES beamline. MAIA uses an ion source based on electron cyclotron resonance (ECR) which produces high currents of atomic ions. MAIA is used to determine the absolute cross-sections (probability of interaction with a particle for a given reaction – here: ion/photon interaction) for the photoionisation processes. By contrast, the experiment comprising an ion trap coupled with the DESIRS beamline is used to store lower quantities of ions than MAIA, but for much longer periods. It uses sources of ions at atmospheric pressure such as those from electrospray ionisation (ESI) or atmospheric pressure photoionisation (APPI) which makes it much easier to bring fragile molecular species, largely in ionic form, in the gaseous phase, where they are much easier to sort, handle and store than neutral molecules. Action spectroscopy using ion traps is a method which has undergone a lot of development over the last ten years, during which time SOLEIL has acted as a pioneer, especially regarding the VUV photodynamics of large gas phase biopolymers. Until now the absolute effective cross-sections of the photophysical processes could not be measured by ion trap methods, solely the relative yields were accessible. 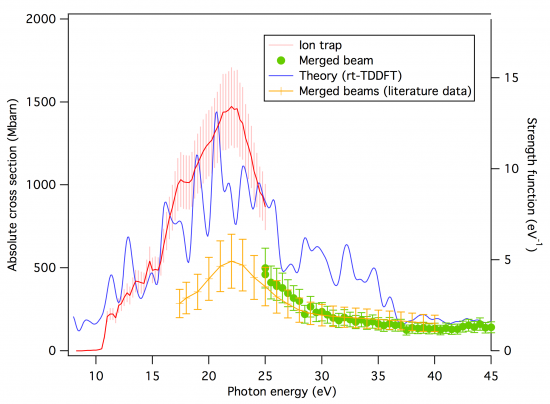 A new method has been developed as part of a collaboration between scientists of the DESIRS and PLEIADES beamlines, INRA and Paris-Sud University, the aim of which is to obtain the absolute effective photoionisation cross-sections in an ion trap. Comparison of the absolute cross-sections of C60+ measured using ion traps, merged beams and by calculation. C60, also referred to as Buckminsterfullerene, is a molecule composed of carbon atoms arranged in the shape of a football. Since its discovery in 1985, the C60 molecule as well as its ions have become objects of interest, notably because of their intermediate position between the atom and the solid. Moreover, it was recently showed that C60+ ion is present in the interstellar medium. Absolute cross-sections for the photoionisation of C60 in both its neutral and ionic forms have been reported in the literature. Measurements made on cationic C60 in merged-beams experiments disagreed with the theoretical predictions and measurements made on the neutral molecule. Within the framework of this collaboration, the scientists therefore decided to focus on this problem. Merged-beams measurements were repeated on MAIA under experimental conditions which avoid certain experimental artefacts (green curve) and which appear to be in agreement with the literature (orange curve). By contrast, ion trap measurements performed on DESIRS (red curve) agree with the quantum calculations (blue curve). The difference between the merged-beams and ion trap methods originates from an excess of internal energy delivered to the system during ionisation in the ECR source producing ‘hot’ ions. The APPI ionisation used for the ion trap experiments is soft and results in colder ions. Moreover, the storage of ions during relatively long periods in the ion trap allows the molecular species to relax, which provides a certain level of control of the target. This work opens the way for the study of the absolute effective cross-sections of fragile molecular targets or large-size molecules which was not possible using ECR ionisation.